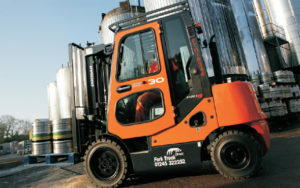 At Fork Truck Direct we stock an exhaustive range of used and refurbished forklifts. We currently have many refurbished forklifts on hire all over the Essex and Suffolk area and, indeed, for those companies looking to purchase or rent refurbished forklifts, we can help here too. Working with leading brands of forklift manufacturers like Doosan, Bobcat, Combilift, and Flexi, we know what makes a quality forklift truck, and one of those things is robustness. Any decent forklift is built along solid and sturdy lines – it’s pretty much in the job description that it needs to be powerful and hardy. This is one of the reasons that a used or refurbished forklift truck can be a sensible alternative to buying new if your budget will not justify it. If a used forklift is refurbished properly it will work just as well as it did when it rolled off the assembly line, so long as you get it from a reputable dealer who knows what they are doing. Once the correct model and spec forklift has been chosen, it is passed over to our refurbishment workshop, and into the trusty hands of Dave Savill, our workshop manager. Dave has over 30 years’ experience in the repairing and refurbishing of industrial vehicles, including a host of forklift truck varieties. The first thing he and his team will do is conduct a detailed and extensive 135 point inspection. Dave’s report is then passed to one of our experienced workshop engineers who carry out all of the required repair work. Once the work is completed, the newly refurbished forklift is resprayed in one of our fully-equipped spray booth and then thoroughly examined by one of our inspectors, who is fully accredited and authorised to issue a certificate confirming the success of a Thorough Examination. A further in-house inspection is performed prior to delivery and, once we are satisfied that this Pre-Delivery Inspection (PDI) has been completed, we complete a certificate of warranty for the truck. Of the many forklifts we have refurbished over the decades, most of our customers comment that, with the high-quality of the work, it’s only the inspection reports and the invoice that tell them its a refurbished vehicle, as the trucks look brand new! Whether you’re looking to buy or simply rent refurbished forklifts, Fork Truck Direct can provide you with the machine you need. Call us on 01245 322252, and let a member of our friendly, professional team sort the ideal forklift solution for your company.